To some people, a pickup truck is just a vehicle that allows them to haul the family, their toys, some random stuff from the hardware store, and help people move. 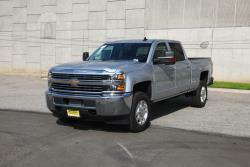 But people who buy the 2017-2018 Chevrolet Silverado 2500HD/3500HD & 2017-2018 GMC Sierra 2500HD/3500HD, usually need a bit more than that. They’re looking for a rig that can haul and tow massive amounts of stuff, day-in and day-out. That’s why GM completely re-engineered their venerable L5P Duramax 6.6L Diesel V8, to create an all new version called the LML Duramax 6.6L. Although it has the same displacement as the old engine, it has lots of cool new tricks to help your truck work even harder. So let’s look at some of those changes, and see how a Duramax 6.6L Cold Air Intake from AIRAID can help you turn up the power even more. The new ram air intake on the 2017-2018 Chevrolet Silverado 2500HD/3500HD and 2017-2018 GMC Sierra 2500HD/3500HD works by pulling in large amounts of air through that giant vent on the hood. This cold air should provide the engine with more oxygen, due to the lower air temperature. However, once the air hits the OE Duramax 6.6L air filter, it will slow down and heat up, because it has to fight it’s way through all of the dirt that has collected on the surface of the filter. As the layer of dirt increases, the volume of air that gets through will decrease, and reduce the amount of power that your engine can make. The air that does make it through the stock Chevy Silverado air filter/GMC Sierra air filter, then has to contend with a narrow intake tube that has all sorts of uneven interior surfaces. This causes the air to swirl around and become turbulent, slowing it down even more. As a result, the air will heat up more, thus reducing the number of oxygen molecules, and consequently, the amount of power that your Silverado HD 6.6L/Sierra HD 6.6L can produce. 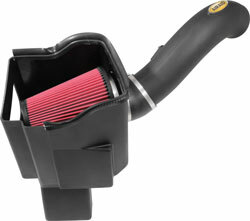 To overcome these horsepower and torque inhibitors, the AIRAID 201-335 MXP Cold Air Intake and AIRAID 200-335 MXP Cold Air Intake replaces all of these restrictive components with low restriction alternatives that are designed to enhance the effectiveness of those high-flow heads and ram air intake ducts. A special high-flow air box is mounted in place of the stock air box and filter, and it’s been engineered to flow considerably more air from that ram air inlet. 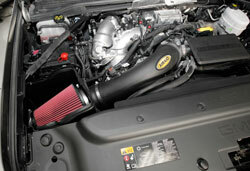 AIRAID 200-335 MXP Cold Air Intake gets an oiled SynthaFlow Performance Air Filter, which is made from multiple layers of cotton gauze, bonded to a layer of proprietary synthetic filter media. AIRAID 201-335 MXP Cold Air Intake gets a non-oiled SynthaMax Performance Air Filter, which is made from a dual-layer synthetic filter media. Both oversized AIRAID air filters can pull in a lot more air than a standard paper filter. And because the dirt is stored inside of the filter material rather than collecting on top, the airflow won’t be reduced nearly as much over time. You also won’t have to buy another expensive Duramax 6.6L air filter, because you can just clean the AIRAID filter every 30,000-50,000 miles (depending on road conditions). All of that clean air is then directed to the engine through a low restriction AIRAID intake tube, which is made from roto-molded polyethylene. Because of our manufacturing process, all of the interior surfaces are completely smooth, resulting in little air turbulence as the air flows through the tube. This material also helps to absorb heat, so the air will be much cooler when it reaches the engine. Each intake tube has integrated fittings for all of the factory sensors, which makes for a hassle-free installation. That’s a serious power gain, and it will help to reduce engine strain when you’re towing or hauling a heavy load. But of course, your individual results will vary depending on the mileage, modifications, and condition of your specific 2017-2018 Chevrolet Silverado HD Duramax 6.6L / 2017-2018 GMC Sierra HD Duramax 6.6L. 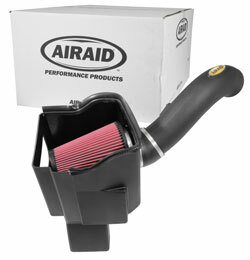 You also need to make sure that this AIRAID cold air intake is street-legal in your state, which you can do by clicking here. With more power, faster throttle response, and the exceptional AIRAID No-Hassle Lifetime Warranty, an AIRAID Duramax 6.6L cold air intake system is definitely a worthwhile investment for your truck!